Tamerlan Tsarnaev, one of the two young men suspected in the deadly bombings at the Boston Marathon was dead after a gun exchange early Friday with police in Watertown, Mass. Authorities said the other suspect, his brother Dzhokhar, was at large and were warning people in the area to stay inside as officers conducted a door-to-door search. Col. Timothy Alben said police went door-to-door, up and down 20 streets in the town of Watertown, conducting “limited searches.” Police followed many leads, but none of them have been fruitful. “We do not have apprehension … but we will have one,” said Alben. The two suspects, authorities initially told NPR and other news outlets, were brothers from Chechnya. Later Friday, relatives said that while the family is originally from Chechnya, the brothers lived there only briefly. The family lived for many years in Kyrgyzstan, before coming to the U.S. in the past decade. Mass transit service in the Boston area was suspended Friday morning. So was taxi service for the first few hours of the day. Drivers were being told to stay off the streets in Watertown. Businesses there were told not to open. Boston city officials asked residents to “please go home” and not congregate at bus stops or other places. Just after 8 a.m. ET, officials said the “shelter in place” advisory had been extended to the entire city of Boston. The dramatic series of events began to unfold late Thursday, with a robbery at a convenience store in Cambridge, Mass., and the shooting death of a police officer on the campus of the Massachusetts Institute of Technology. Minutes later, officials say, an SUV was carjacked in Cambridge. At least one other police officer was shot and wounded early Friday. That SUV was driven to Watertown. There, authorities say, the suspects threw explosives at police and exchanged gunfire. One of the two — known as “black hat” for the cap he was seen wearing at the marathon — was critically injured and later died. The other, “white hat,” fled the area and was being sought. We’re following the story and updating as news comes in. There’s a timeline of the manhunt posted here; a story about the Boston lockdown is here; a profile of the suspects is here, and NPR’s coverage of the bombings and the search for the suspects is collected here. Meanwhile The Boston Globe tweets that one of its photographers can hear police talking to a person they believe is the suspect. An FBI source tells NPR’s Dina Temple-Raston that police have located the suspect. “Officers are proceeding with caution as an official fears the suspect may have booby-trapped the scene. “FBI is waiting for a tactical team and bomb technician. President Obama spoke to Russian President Vladamir Putin today. Putin, the White House said, expressed his condolences on behalf of the Russian people. Col. Timothy Alben asked Dzhokhar to “stop any further violence toward anyone,” and turn himself in. Alben said Dzhokhar escaped on foot, because police did not have enough police to create a perimeter. But Alben said he believes the fugitive is still in Massachusetts. During a news briefing in Watertown, Massachusetts, a short time ago, authorities said the “stay-indoors request” has been lifted, but that no suspect has been arrested. Col. Timothy Alben said police went up and down 20 streets, “door to door” conducting “limited searches.” Police followed many leads, but none of them have been fruitful. WBUR quotes a Massachusetts State Police spokesperson saying the two suspects in the Boston Marathon bombing case did not rob a convenience store last night. “The bombers did purchase gas at a gas station in Cambridge later in the chain of events and we recovered images of them there,” State Police spokesperson Dave Procopio told WBUR. We’re also awaiting a news conference, scheduled for 5:30 p.m. ET. NBC News spoke to John Curran, who coached Tamerlan when he was a boxer. It is yet another person completely stunned that Tamerlan would be suspected in the Boston Marathon bombings. Tamerlan was “athletic, outgoing, nice guy, very respectful, just the opposite of what you paint as a terrorist,” Curan told NBC News. WBUR spoke to Adhi Moro who was friends with both brothers. He gave a little more detail on Tamerlan, the older brother who was killed this morning. The Red Sox and Bruins have cancelled their games in Boston tonight. Update at 2:59 p.m. ET. Dzhokhar’s Twitter Account? A classmate of Dzhokhar tells NPR’s Andy Carvin that the twitter account @J_Tsar was indeed his. Another classmate tells Buzzfeed the same thing. Dzhokhar also appeared to have an Amazon Wish List. Among the items on it, books on how to forge driver’s licenses and books about Chechen history. Radio Liberty, an overseas news service funded by the United States, spoke to Anzor Tsarnaeov, whom they and the AP identified as the suspects’ father. According to an English translation by Sergei Sotnikov, a producer at NPR’s Moscow bureau, the father said he could not imagine his sons doing such a thing. This is very much in line with what the suspects’ aunt, Maret Tsarnaev, told NPR’s Joe Shapiro. “This totally doesn’t make sense to me,” she said, adding that authorities had not released definitive proof that these were the people responsible for the Boston blasts. The State Police said the controlled explosion would take place to ensure the safety of the law enforcement officers at the scene. The family of the slain MIT officer tells The Boston Globe that they are “heartbroken” at the loss of Sean Collier. 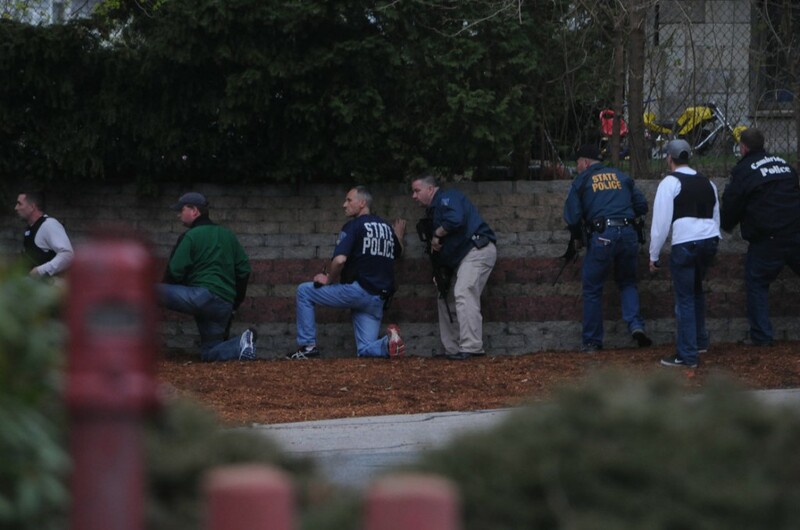 Police have now searched “well over 60 or 70 percent of want we want to cover” in Watertown, Col. Timothy P. Alben, superintendent of the Massachusetts State Police, just said to reporters. He also said there will be a “controlled explosion” later this afternoon on Norfolk Street in Cambridge — presumably at or near a home where at least one of the suspects lived. “The stay indoors request continues,” Gov. Deval Patrick (D) just told reporters. Update at 12:30 p.m. ET. About The Suspects And The Family. — While the family is Chechnyan, it lived in Chechnya for just one year, in 1994. Like many Chechnyans, members of the family were forced to flee during World War II and spent decades in Kyrgyzstan. — Tamerlan Tsarnaev, the older suspect who was died early Friday, became a more devout Muslim in recent years. But she does not believe he carried a hatred toward other religions and says he fathered a child by a Christian woman. Update at 11:45 a.m. ET. “He Put A Shame!” On Family And Chechens, Uncle Says. Calling them “losers” and saying that the suspects had “put a shame!” on their family and all Chechens, a man identified as an uncle of the Tsarnaev brothers just gave reporters in Boston an emotional statement. And Ruslan Tsarni appealed to suspect Dzhokhar Tsarnaev to turn himself in. A police spokesman just told reporters that authorities do not believe Dzhokhar Tsarnaev is at the latest location where a tip brought heavily armed officers to the scene in Watertown. “UMass Dartmouth is closed and is in the process of a controlled evacuation of the campus. Students, staff and faculty have been asked to leave campus in a calm and orderly fashion. This action is in response to information that the person being sought in connection with the Boston Marathon bombing is a registered student. State, local, and campus police are on campus to assist with the evacuation and to conduct a full investigation.” The school is located 60 miles south of Boston, near New Bedford, Mass. CNN reports it has been told by law enforcement sources that the latest area of Watertown where police have brought in heavy forces and have asked the media to move back is where a possible accomplice of the suspects is located — not fugitive Dzhokhar Tsarnaev. “He is such an intelligent boy. We expected him to come on holidays here,” the father also said. Earlier Friday, officials told taxis to stay off the streets of Boston. Boston Police now say taxi service has been restored. Reporters have been told for at least the second time today to move back from a neighborhood in Watertown. TV images show that police have their weapons drawn. Update at 10:30 a.m. ET. Police Are Looking For A Honda CRV With Massachusetts Plates. Update at 10:20 a.m. ET. How Did “A Beautiful, Beautiful Boy” Get Involved? “It’s stunning,” WBUR host Robin Young says of hearing that 19-year-old Dzhokhar Tsarnaev is the fugitive who’s suspected of being one of the young men who planted the bombs at the Boston Marathon and now of being involved in deadly gun battles with police. “I had the prom party for that class in my back yard,” she says of Cambridge Rindge & Latin High School students, who included Tsarnaev and Young’s nephew Zolan. If anyone says that 19-year-old Dzhokhar Tsarnaev’s “character, attitude … or activities that he did daily” would have indicated he was likely to bomb the marathon or engage in shootouts with police, “they’re absolutely lying,” says a friend of the fugitive. Zolan Young, nephew of WBUR’s Robin Young, spoke with Morning Edition moments ago. He’s known Dzhokhar Tsarnaev since they were both in high school. “I can’t emphasize how much a courteous guy he was,” Zolan Young said. “This was someone that I could always count on.” The last time Young heard from Tsarnaev was during this year’s Super Bowl, when Tsarnaev texted him to ask if Young was having a party. As people search for information about the suspects, they’re coming on some interesting material on social media sites. Bear in mind: It will be hours, if not days, before material on such sites can be verified. One that’s getting particular attention: This photo gallery of a young man identified as Tamerlan Tsarnaev, the suspect who died after a gun fight with police. This caption is under one photo: “Originally from Chechnya, but living in the United States since five years, Tamerlan says: ‘I don’t have a single American friend, I don’t understand them.’ ” There’s a page reported to be about Djohar Tsarnaev here (we’re seeing his named spelled as “Dzhokhar” in other places). According to the uncle, the young men were born in Kyrgyzstan. A law enforcement source of NPR’s Carrie Johnson tells her that his agency increasingly believes that Dzhokhar Tsarnaev, the suspect who police are searching for, is acting in a way that indicates he does not want to be taken alive. When he heard gunshots and explosions overnight, Dr. David Schoenfeld of Beth Israel Hospital tells Morning Edition, he went to the hospital. Soon after, an injured man — the bombing suspect now identified as 26-year-old Tamerlan Tsarnaev, was brought in. He had “multiple traumatic injuries,” Schoenfeld says, from “bullet wounds or shrapnel.” Doctors worked to keep him alive, but it was quickly apparent that their efforts would not be successful. The suspect who authorities are searching for apparently made his escape by driving the stolen SUV straight at police and forcing his way through, NPR’s Tom Gjelten reported on Morning Edition. The “shelter-in-place” advisory has been extended to the entire city of Boston as well as such suburbs as Watertown and nearby communities, Boston Police Chief Ed Davis just told reporters. There are about 4.5 million people in the Boston metropolitan area. With mass transit in and around Boston shut down while the search for the suspect continues, NPR’s Jeff Brady reports from Watertown that buses are being used to bring more police officers to help in the manhunt. NPR’s Dina Temple-Raston tells Morning Edition that National Security Council officials say the dead suspect was Tamerlan Tsarnaev, who as we reported earlier is said to be the older brother of the young man who is still on the run. Authorities say the brothers are from Chechnya. The New York Times says the suspect who was killed is 26-year-old Tamerlan Tsarnaev. NPR has not independently confirmed that name. A third man, who authorities believe was an accomplice of the bombing suspects, has been arrested according to NPR’s Dina Temple-Raston. He may be the man, seen in videos earlier Friday, who police ordered to strip naked and was then put in the back of a patrol car. The Associated Press and NBC News minutes ago reported being told by sources that authorities think they have determined the identities of the two bombing suspects, and that they are brothers. NPR’s Dina Temple-Raston checked with her law enforcement sources as well and is being told that the suspects are from Chechnya and that the suspect who is on the loose is 19-year-old Dzhokhar A. Tsarnaev. “With MBTA suspended, please do not congregate at stations and bus stops. Please go home,” the city of Boston says on its official Twitter page. Update at 6:20 a.m. ET. Recapping The News. Police have locked down several neighborhoods in Boston and its western suburbs — Watertown, Newton, Waltham, Belmont, Cambridge and the Allston-Brighton neighborhoods of Boston to stay indoors. All mass transit was shut down. Classes at MIT and Harvard have also been cancelled for Friday, the universities announced. Update at 5:05 a.m. ET. Boston Police Commissioner’s Statement On Death Of Suspect. The bombing suspect known as “black hat” for the color of the cap he was seen wearing at the marathon was killed in the exchange of gunfire with police in Watertown, sources with knowledge of the events tell NPR’s Dina Temple-Raston. Update at 4:35 a.m. ET. Prosecutor’s Account Of The Events. “Police are investigating a fatal shooting of MIT campus police officer by two men who then committed an armed carjacking in Cambridge, Middlesex Acting District Attorney Michael Pelgro, Cambridge Police Commissioner Robert Haas, and MIT Police Chief John DiFava announced this evening. “At approximately 10:20 p.m. April 18, police received reports of shots fired on the MIT campus. At 10:30 p.m., an MIT campus police officer was found shot in his vehicle in the area of Vassar and Main streets. According to authorities, the officer was found evidencing multiple gunshot wounds. “He was transported to Massachusetts General Hospital and pronounced deceased. “A short time later, police received reports of an armed carjacking by two males in the area of Third Street in Cambridge. The victim was carjacked at gunpoint by two males and was kept in the car with the suspects for approximately a half hour. The victim was released at a gas station on Memorial Drive in Cambridge. He was not injured. “Police immediately began a search for the vehicle and were in pursuit of the vehicle into Watertown. “At that time, explosive devices were reportedly thrown from car by the suspects. The suspects and police also exchanged gunfire in the area of Dexter and Laurel streets. During this pursuit, an MBTA Police officer was seriously injured and transported to the hospital. Col. Timothy P. Alben, superintendent of the Massachusetts State Police, just told reporters that after the shooting at MIT, an SUV was hijacked in Cambridge, Mass. Police in Watertown pursued the vehicle. Explosives were thrown from that SUV and shots were exchanged. The other suspect is said to be at large and authorities have released a photo of him. The state police say he resembles “suspect No. 2” in the bombings. A source with knowledge of the situation tells NPR’s Dina Temple-Raston that the situation is fluid and that it’s too soon to say for certain whether or not the individuals involved in the events that began at MIT and have extended into Watertown are related to the marathon bombings. Update at 3:55 a.m. ET. Residents Warned To Stay Inside; Door-To-Door Search Expected. “The officer had been responding to report of a disturbance Thursday night when he was shot multiple times, according to a statement from the Middlesex district attorney’s office and Cambridge police. It said there were no other victims. Note: As happens when stories such as this are developing, there will likely be reports that turn out to be mistaken. Wednesday, for example, there were reports from CNN, the AP, WBUR and others that authorities either had arrested a suspect or were about to do that. It turned out that no one had been arrested or taken into custody. We will focus on news being reported by NPR, other news outlets with expertise, and statements from authorities who are in a position to know what’s going on. And if some of that information turns out to be wrong, we’ll update. Take me back to the top of this post.